Since January is Get Organized month, it seemed fitting to write a post about those items that people typically don’t know how to dispose of. We all have one or two items kicking around the basement or garage that we don’t really want or need, but we just don’t know what to do with. Keep reading to find out how to declutter your home without adding to the landfill. 1) Paints: I don’t know about you, but I have some paint samples hanging around from when I was trying to decide what color to paint my living room. I also maybe have a can of paint that matches the color the living room USED to be sitting in my basement that I haven’t wanted to deal with. A quick web search revealed that a great first step is to think about if you know anyone who could use some paint. Habitat for Humanity or other groups may be interested in good condition paint. In thinking for a few minutes, I realized I know of some kids painting a mural that may love some free paint! For all the paint that you need to dispose of, the folks at www.paintcare.org can help if you live in one of the states they service, or you can call them at 1-855-724-6809 for information about how to best dispose of all varieties of paints and some other chemical products like roof patch and motor oil! If you don’t live in their area, you can try a quick web search with the search term “How do I dispose of paint in (your state)” and you should find someplace near you. 2) Electronics: Old cameras, phones, computers, printers… most of us have at least one old piece of equipment hanging around because we know that we shouldn’t toss it, but where does it go? Best Buy is a great resource; according to their website, they accept small electronics and old rechargeable batteries at US locations, check the link to their page for some store FAQ’s. 3) Shoes: Shoes in good shape that may have been outgrown should be donated, if you don’t have a favorite local charity, you can check out Soles 4 Souls, which has a variety of drop-off locations and will pass your shoes on to someone in need. If you have athletic shoes that aren’t in great condition, you can drop them off at a Nike store to be repurposed into sports surfaces, click here for more details. 4) Clothing: I’m pretty sure we all know that you can donate or consign clothes in good condition, but who hasn’t guiltily thrown an item of clothing in the trash because of a stain or small tear? Well, guilt no more! First, you could upcycle those old clothes; cut them into squares and use them as cleaning rags! If you just don’t want the old clothes in the house anymore, you can contact H&M or The North Face, both of which will accept clothing in any condition from any manufacturer. Patagonia has a cool program where you can bring in old Patagonia clothing, but they also have classes to teach you how to get more out of your clothing so you need to buy new gear less often, lessening environmental impact. I also found many local programs, so feel free to do a search for an option in your area. There are so many more items, but even in researching I found a few items that I know I can now recycle. One last tip – do not be afraid to call your local recycling center if you have something you don’t know what to do with. I once had a box of old VHS tapes and was surprised to learn that I could toss them right in my single stream recycling bin, the folks at my local recycling center were happy to tell me what they do and don’t accept. Please feel free to leave your tips for other hard to dispose of items below! 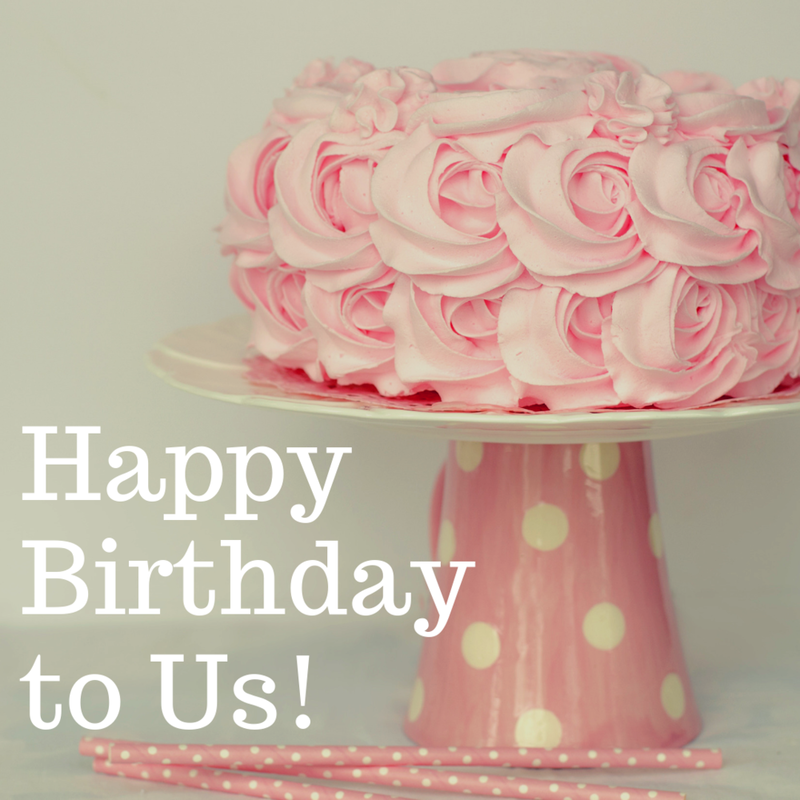 It's Our Birthday! We're 5! As I sit down to write this, I am amazed that it has been 5 years since I started Kosmatology. I never thought I would be the creator and owner of an organic skin care line and part of the clean beauty revolution, but wouldn’t change a moment of my journey. When my children were born, I was on a mission to live a clean lifestyle for them and our family. I researched so much and drove my husband crazy (I still drive my husband crazy) with eco-friendly products and habits such as cloth diapers. However, my real journey didn’t begin until my youngest, Cameron, developed horrible eczema at 3 months old. Trips to the pediatrician just ended up with prescriptions for steroid creams and no real explanations. Here is where I was able to put my years of experience as a compounding pharmacist to work. After lots of research and experimenting, I developed what ended up being Kosmatology’s first product, the Goody-Goody Grapefruit Lotion bar. 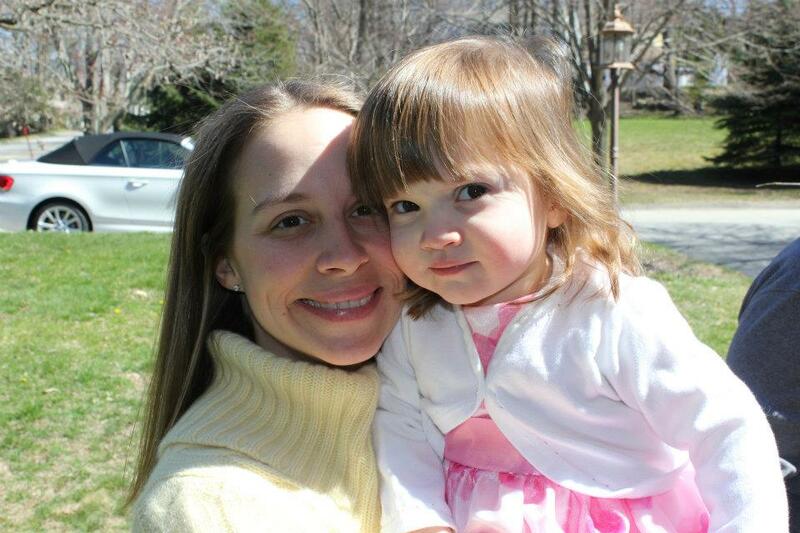 By just trying to treat my daughter’s eczema naturally, I ended up inadvertently creating a company and job I love. Not only do I get to do something I love every day but also I have met so many amazing people along the way; many that I now consider friends. I have loved being part of the clean beauty community, enjoyed learning so much along the way and look forward to the next 5 years. Thank you all for supporting me and letting me do something I love! HELLO LADIES! I'm here with what will be the first in a series of guest posts in collaboration with Kosmatology. My name is Francesca of the green beauty blog GREEN GLAM GIRL. If you have been following since I started my blog you will know that Kosmatology has been one of my all time favorites in green beauty since I first was introduced to the products over a year ago. In case you don't know why check out my interview with founder Janis Covey. Let's talk about what happens when we go from summer to fall and then winter. If you live in a climate that has drastic changes in weather like Janis and I do, then you know everything goes to bone DRY. Especially our feet! Am I right or what?!?! I feel like we women beat our feet up so bad! Between the shoes we wear (i.e. heels, flip flops, pointed toe shoes, etc), being on our feet all day and everything else. If you are a mom you can relate to the putting everyone else first and not taking time for "self care". Guilty as charged! WHAT TO BRING TO A SALON PEDICURE? This brings me to the topic of when you are able to take the time and go for professional pedicures to care for those puppies! Recently I took some time and went for a pedicure and brought all of my own stuff. Alexa took such good care of me and was so sweet. She was totally ok with using my products and even asked me about all of them. Good opportunity to spread the "green" beauty word! First things first! Typical salon pedicure includes a tub filled with warm water and then typically what goes in that bath is green or blue salt. When have you ever seen green or blue salt in the wild?? Never! Yuck! Who knows what is in that stuff! However, I do know what is in Kosmatology Mint Your Feet Salt Foot Scrub. I have you covered! That's it! So how about bringing Kosmatology Salt and having the pedicurist add a tablespoon to the water instead of their salt soak. The mineral soak doubles as a salt scrub. Then have them use it to scrub the bottom of your feet. Two for the price of one! OOOOh how amazing your feet will feel after! Aqua (Water) (Eau), Isopropyl Palmitate, Stearic Acid, Propylene Glycol, Cetyl Alcohol, Hydrogenated Soy Glyceride, Aloe Barbadensis Leaf Juice, Tocopheryl Acetate, Retinyl Palmitate, Dimethicone, Polysorbate 60, Sorbitan Stearate, Talc, Carbomer, Trisodium EDTA, Triethanolamine, Parfum (Fragrance), Methylparaben, Ethylparaben, Propylparaben, Phenoxyethanol. You tell me which one will dry out your feet even more than they already were?? Yes you got it, the conventional lotion. When I was at the salon for my pedi, Alexa rolled the balm on my feet. You heard me, rolled! Such a great idea for foot balm. You may be wondering about now, "Francesca seriously!! Ain't no body got time for that." I hear you girl loud of clear! Do what I usually do. Give those tired and dry tootsies some TLC at home. Janis suggests adding a tablespoon of the Mineral Salt Foot Scrub to your foot bath basin (or sit at the edge of your bathtub) and let your feet soak for pure bliss. I actually just picked up a bath at Home Goods. So I took Janis' suggestion and boy was that a treat. Also I like to bring the salt in the shower and put some of it on a pumice stone and scrub the bottom of my feet. Finally, the peppermint and eucalyptus cools, soothes and revitalizes my tired pups. Now girls I'm about to drop a "balm" (yes pun intended LOL) on you...CRACK kills. I am not talking about my latest visit from the plumber either. Personally the heels of my feet crack from dryness and everything else I do to my feet during the day. I am talking about the Mint Foot Balm. It is a must have for the nightstand. 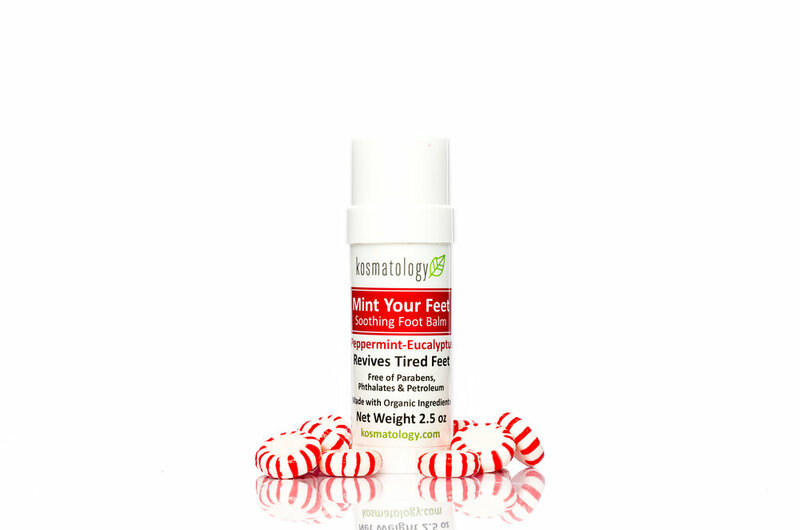 That's right, the foot balm continues the pampering session with organic peppermint and eucalyptus to cool and soothe. The organic shea butter, coconut oil and olive oil works to repair and rehydrate those footies! Yes and yes!! I use this every night before I get under those covers! Also, if you want to be a little "extra" put a pair of socks on after you roll the balm on and in the morning your feet will be screaming for joy. Try these tips all winter long and come summer you will be flip flop and sandal ready. Because let's be real girls, we are all just counting down until beach season again! :) Grab a Mint Your Feet Gift Set at www.Kosmatology.com for you or your bestie! It's the perfect winter treat!